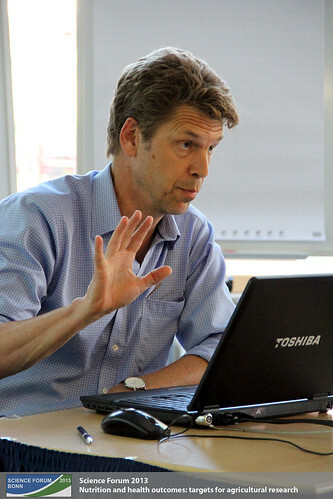 The oral presentation session “Food consumption, consumer preference and human health” hold rich reminders why agricultural research should not only focus on food production, but always need to keep an eye on the consumption side. Under the order of NSA, Hannah Jaenicke presented a holistic framework on how to narrow the gap between the already quantitatively sufficient supply of nutrients and a qualitatively balanced diet. Even though, this does not relate to the latest scandals from the US, her transatlantic observations for example included the fact even within one household some members are obese while others are undernourished. 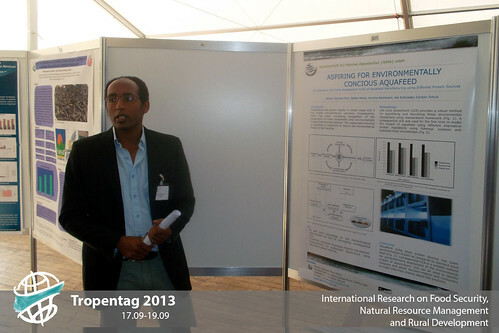 Only 6 posters were presented in the session, and another hand full of people listened to them on early Thursday morning, so that Mr. Fitwi, moderator of the Poster presentation session “Aquaculture, fisheries and fish“, referred to them as the “underdogs” of the Tropentag 2013. However, the wide range of topics presented during the sessions shows that aquacultural research does not need to hide away from the big stages, but actually addresses very urgent topics such as depleting resources and women empowerment. Pigs won’t drive a car anytime soon, around 30 people learned, when listening to the presentations “Nutrition of monogastric animals”. The oral presentations during the Wednesday morning session represented the huge variety of aspects under the umbrella of ‘Intensive Livestock systems and services’, but stood in keen competition with time constraints due to a pushed forward lunch break. The pictures of the Carrot City project in the exhibition area around room B3, take you on a journey to different urban gardening projects in different cities of North America and Europe from the ground up to the roof of several leveled houses.